The majority of Hong Kong employers plan to hire fresh graduates over the next three months – but the young jobseekers' salary expectations are slightly higher than companies' going rates, the results of the new CTHR Recruitment and Salary Trends Survey – 2016 show. Nearly two-thirds of the employers surveyed (64%) said they intended to hire fresh graduates over the next three months, at a median rate of three new graduate recruits per company, according to the poll of 205 employers across at least 16 industries, 269 fresh graduates and 58 undergraduates. Employers who planned to recruit fresh graduates cited "willingness to follow instructions" as their main reason, followed by "lower salary expectations" and "able to handle more challenges". Of the graduates who took part in the survey, 77% said they would start a full-time job search in the next three months, with their preferred industries being banking and finance (25%), the media and communications (16%) and government sector (14%). 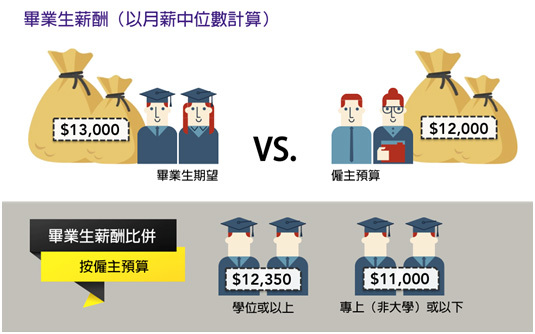 Employers pegged median starting salaries for graduates with bachelor's degrees at $12,350, while the graduates themselves expected HK$13,000. Slightly more graduates (46%) were optimistic about their future careers than those who were pessimistic (38%), and the vast majority of both employers and fresh graduates expected graduates to stay in their first jobs no longer than one to three years. Just over half of the 132 respondents who planned to hire graduates in the next quarter said they planned to recruit a mix of candidates with bachelor's degrees and higher and those without degrees. The employers scored fresh graduates on a range of personal and professional attributes, with the highest ratings being "willingness to learn" (6.3 out of 10), "willingness to face challenges" (6.1) and "work attitude" (6.1).